Simply click the button to download CrazyTalk Animator 2. After downloading, the program will guide you through a step-by-step installation process. 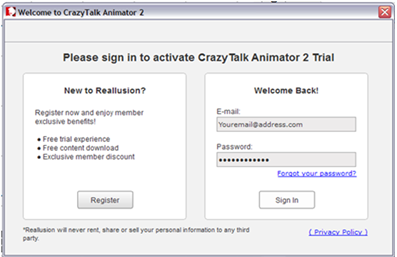 CrazyTalk Animator 2 will be activated once you enter in your Reallusion account information. If you are a new user, you’ll need to register first. After you’ve registered, you’ll receive an email with an activation URL. 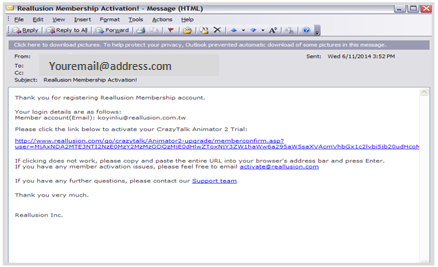 Click the link to officially activate CrazyTalk Animator 2. 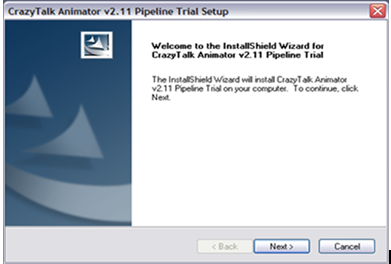 Once you’ve finished installing, you’ll receive an email titled “Quick Tips & Free Resources for Learning CrazyTalk Animator 2”. Click the banner in the BLUE box, and you will received your free bonus gift of 100 Animated GIFs. 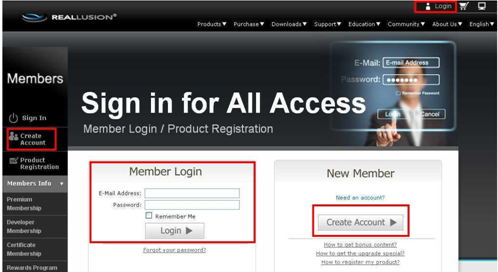 Please go to Reallusion MemberPage & click "Create Account" .If you already have a Reallusion member account, please login directly. Click the first button to access your Registered Product page. 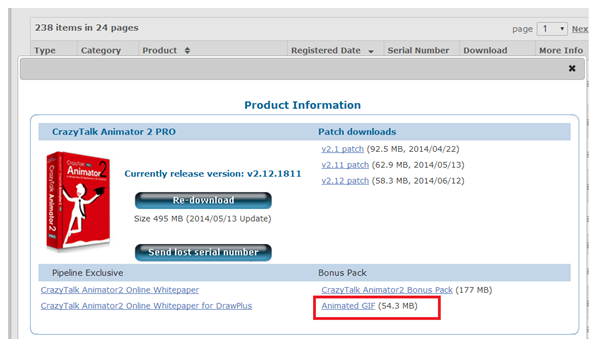 Find CrazyTalk Animator 2, and click the Patch/Bonus in the More Info column. Product Information page will be displayed where you can find the Bonus Pack section for the Animated GIFs. You may click the download link accordingly. What if you already purchased this pack that they're now giving away free? This giveaway is GIFs only, not the actual characters or motions. If you bought the content pack, then you can just as easily make these yourself. Now, When I installation trial version. 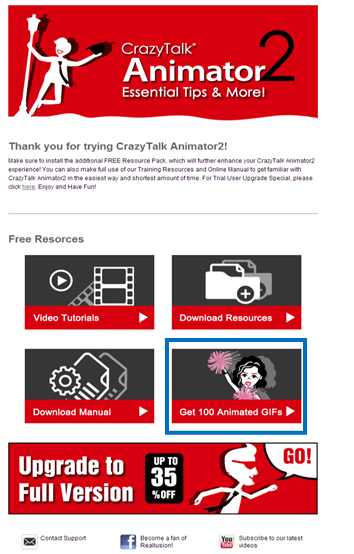 I can't receive "Quick Tips & Free Resources for Learning CrazyTalk Animator 2" title mail. Thanks for these give away GIFs. 1. How can I use them in Crazy Talk2? When I go to import model it only shows .ctactor in the file list. Is there a way I can install them in the actor or animation folder? 2. Where do I find the 3d motion key editor? I've got the latest version 2.12.1811.1 and in the left tool bar it only shows the 2d motion key editor option. Maybe you can refer me to a video tutorial explaining this. 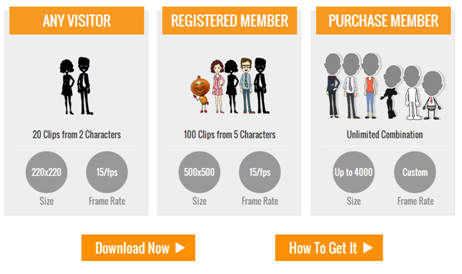 The 100 Free Animated GIF's are exports from CrazyTalk Animator 2. They are for use in presentations such as PowerPoint, Keynote etc. They are not intended for use in CTA2 itself, although they can be loaded as static props if you wish. For the 3D Motion Editor, you must be using CrazyTalk Animator 2 Pro or Pipeline versions. This feature isn't available in the Standard version. Which version of CTA2 are you using? If you are not receive FREE animated gif files download link then simply send an email to reallusion support desk. They will send the link. I wonder which side I can download gif pack ? how to make a couple of scenes with different backgrounds in the same project ? Usually you would create a separate project for each scene. Export the video from each scene and then combine in a video editor for your final result. You can only have one pre-built "Scene" per project since loading another pre-built "Scene" replaces the previous pre-built "Scene". If you manually build a scene (by adding one object at a time) then you make multiple scenes in different areas of the stage. One problem then becomes managing the various objects for multiple scenes as well as the memory usage. The biggest issue is when you go back to the beginning and make a change it can cause a ripple effect which means you have to fix everything from that point on to the end of the timeline. Smaller projects, one project per scene, are the best way to go.